Avani Technology Solutions Inc. is certified as 'Oracle Gold Partner,' which allows us to offer the full spectrum of Oracle products for resale and support. Avani Technology Solutions Inc. is certified as 'Microsoft Certified Partner,' which allows us to offer the full spectrum of Microsoft products for resale and support. Avani Technology Solutions Inc is a Silver Partner of SAP Success Factors, enabling us to offer you SAP's complete portfolio of industry-leading solutions. We can help you buy, build, implement, service, support and run the SAP solution that best fits your unique needs. Avani tech solutions has been listed as an 8(a) STARS II GWAC Industry Partner which offers the unique opportunity to contract with and provide flexible access to customized IT solutions from a large, diverse pool of 8(a) industry partners. Avani Technology Solutions Inc. was certified as a Minority Owned Business Enterprise (MBE) by the New York state Department of Economic Development, Division of Minority and Women's Business Development. Avani Technology Solutions Inc. is a proud participant in the United States Government E-Verify Program, that compares information from an employees Employment Eligibility I-9 form with U.S. government records. 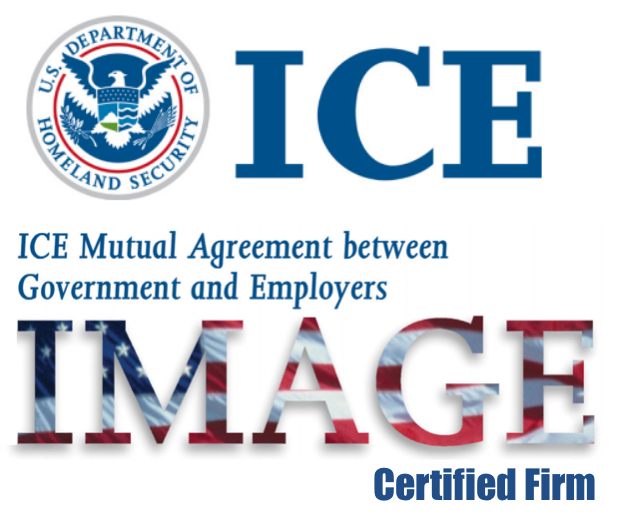 Avani becomes a CERTIFIED member of IMAGE employment compliance program by US Immigration And Customs Enforcement (ICE) group or "ICE Mutual Agreement between Government and Employers." To qualify for IMAGE certification, partners agree to conduct a self-assessment of their hiring practices to uncover vulnerabilities that could be exploited by unauthorized workers; enroll in E-verify, an employment eligibility verification program; train staff on IMAGE Best Employment Practices and the use of new screening tools; and undergo a Form I-9 audit by ICE. Upon enrollment in and commitment to the IMAGE Best Employment Practices, program participants are deemed "IMAGE certified," a distinction DHS and ICE believe will become an industry standard. IMAGE also provides free training to all employers on the provisions surrounding the Form I-9, fraudulent document detection, and building a solid immigration compliance model. The recognition is the another testament of Avani team's solid compliance practices and adheres to the best industry standards. Avani Technology Solution Inc. was certified in Quality Management System which complies with the requirements of ISO 9001:2008 for the scope of 'Provision of product design and support services for software products, and IT staffing'. The NAVSEA Warfare Centers established the Seaport Enhanced (Seaport-e) Multiple Award Contract (MAC) vehicle, using a web-based, e-business procurement Portal, to facilitate performance-based service acquisition, leverage buying power, improve business intelligence and reduce cycle time. Our firm is eligible to participate as a DBE on Niagara Frontier Transportation Authority, MTA, New York State Department of Transportation and Port Authority of New York and New Jersey assisted projects in the identified service areas with the following NAICS codes; 541511, 541512, 541513, 518210. India development facility named under Avani Tech Solutions Pvt. Ltd., was certified in Information Security Management System (ISMS) which complies with the requirements of ISO 27001:2005 for the scope of 'Software development life cycle support for customers includes corporate support functions'. AVANI tech solutions is a certified GSA Contract Holder that allows all federal agencies to purchase from the company in a streamlined manner. Avani Technology has been Ranked #226 in the Technology Fast 500 - a leading technology awards program by Deloitte, by combining Technological Innovation, Entrepreneurship, and Rapid growth. From a small set up in 2008 to a fully fledged thriving IT firm currently, Avani Technology Solutions has certainly made its presence felt in its respective domain. So much so that it is has been honoured by being included under the club of Inc. 500 fastest growing private companies of America. Nothing represents the transformation from a small start up to a big progressive business better than a recognition and support from the government of United States of America itself! Avani Technology Solutions is a SBA 8(A) certified firm which entitles us to render our services to the federal as well as the state governments. With a growth rate of 1,916% over a span of 3 years, Avani Technology Solutions has time and again proved itself as a force to be reckoned with. CIO Review's special mention of Avani Technology Solutions as one of the '20 Most Promising Enterprise Mobility Companies' is also one notable feather in our cap of accomplishments. 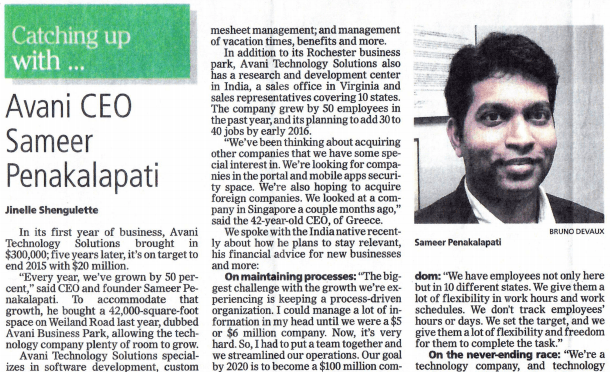 Avani Technology Solutions got shortlisted to be included under the ever elusive and exclusive club of Rochester Top 100 companies as of 18th of August, 2014. It just goes to act as a testament of our company's extraordinary growth and accomplishments in a relative short span on time. With the kind of continuous growth that we have been consistently projecting over the past 7 years, one can't help but to stop and take notice. Avani Technology Solutions at the forefront of it all has managed to bring in a breath of fresh air in the industry of pricy complex HCM solutions and have delivered products so economical that even small businesses can afford them. Avani has created a niche for itself by providing agile, user friendly and cost effective innovative HCM Solutions which led to us being awarded the product of the year 2014 by Silicon India 100. It is the first year of business, Avani Technology Solutions brought in $300,000; five year later, it's on target to end 2015 with $20 million. "Every year we've grown by 50 percent ," said CEO and founder Sameer Penakalapati. To accommodate that growth, he bought a 42,000-square-foot space on Weiland Road last year, dubbed Avani Business Park, allowing the technology company plenty of room to grow. After nearly doubling company revenues last year, Avani Technology Solutions Inc. is ready to grow its top line by another 50 percent in 2015. The tech firm is in the right industry for dramatic growth, its leaders say. "It's changing, so as long as we stay focused on technology we take advantage of (the changes). There's so many opportunities. 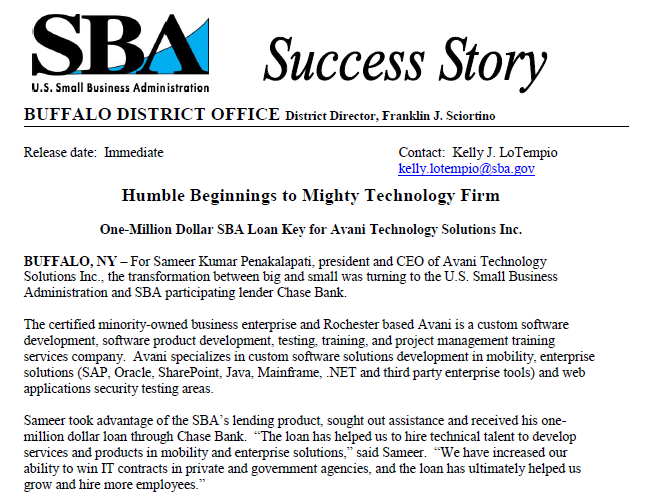 For Sameer Kumar Penakalapati, president and CEO of Avani Technology Solutions Inc., the transformation between big and small was turning to the U.S. Small Business Administration and SBA participating lender Chase Bank. The certified minority-owned business enterprise and Rochester based Avani is a custom software development, software product development, testing, training, and project management training services.